Mooove over, cream. 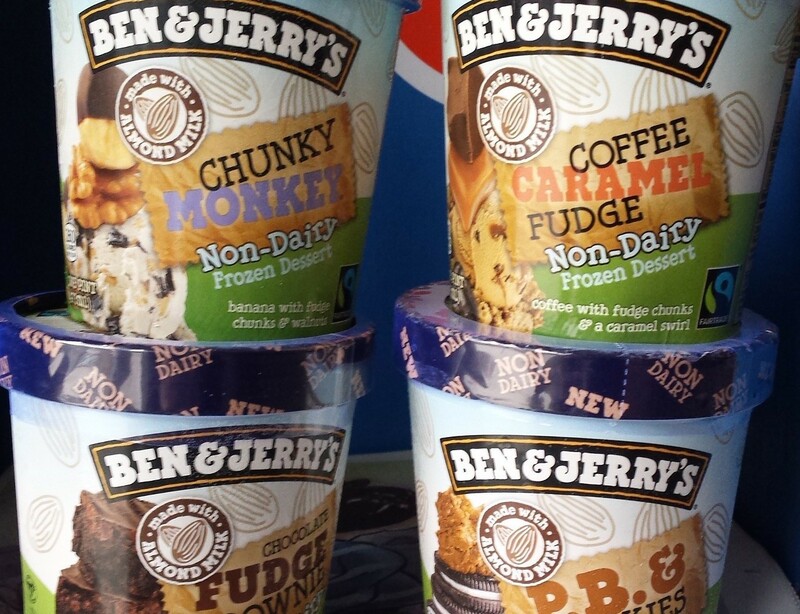 Ben & Jerry’s is about to release its new, dairy-free line, including classic flavors Chunky Monkey and Chocolate Fudge Brownie, along with two new ones: P.B. & Cookies and Coffee Caramel Fudge. Made with almond milk, the frozen desserts took an entire year to develop, according to a company press release. The pints will hit Vermont grocery stores in three to five weeks. Since the non-dairy ice "cream" is not officially available yet, some nice folks from Ben & Jerry’s brought samples to the Seven Days office. So, for Sugar High! this week, I decided to enlist help from a few colleagues in giving them a try. Most people in the office are pretty indifferent to free food. Just kidding! I think about half of them were crowded around my desk within minutes. And we had a favorite: P.B. & Cookies. Testers agreed there wasn’t a noticeable non-dairy taste. Creamy and rich, it was packed with whole Oreo-type cookies and generous swirls of peanut butter. Results otherwise were mixed. Read on for a few tasting notes from Seven Days staffers. Sugar High! is a weekly exploration into the Vermont dessert scene. It features everything from chefs to recipe tips to the best sweets on Vermont menus. Got an idea for something you'd like to see in Sugar High? Email melissa@sevendaysvt.com. Melissa was a food writer at Seven Days.